On December 26th, 2010 Woburn Police Office Jack Maguire was killed in the line of duty. On December 27th a tribute page on the social networking site Facebook was set up to honor Officer Maguire allowing people to post their comments of condolence to the family and fellow officers of the slain hero police officer. But, what happened next was nothing short of amazing. Within 24 hours of the tribute page being established more than 5,000 people had joined the page and posted comments expressing their sadness and outrage. Within 48 hours the site had garnered more than 16,000 members. By the end of that week more than 20,000 people had joined, posting information about the wake and funeral, stories and photos of the events and news accounts of how his killer had been set free by a parole board who was so out of touch with reality that they let loose a violent criminal to roam the streets and commit more violence. 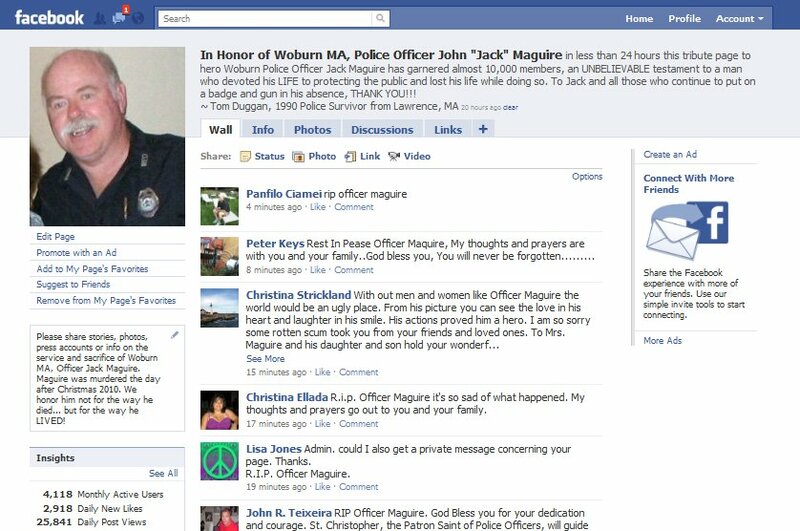 At the time we went to print, the Facebook page “In Honor of Woburn MA, Police Officer John “Jack” Maguire” had nearly 23,000 people who joined and participated on the site. And, while a posting a message on a website may not be as personal to the family of a slain officer or anyone else, the mere fact that a site like Facebook can be used to facilitate 23,000 people reaching out to the family and friends of a slain police officer (all at once) is truly amazing. The board of the Valley Patriot wants to thank everyone at Facebook and every single one of the 23,000 people who joined the page “In Honor of Woburn MA, Police Officer John “Jack” Maguire”. We know that the messages of condolences and the sheer volume of people reaching out to the Maguire family, friends and fellow officers has brought a little comfort to them in a time of tragedy.